An elegant set with top of the line quality. 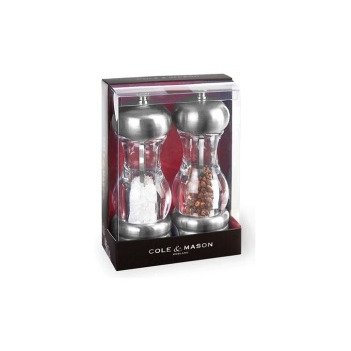 Features two mills with a stainless steel top, acrylic chamber, carbon steel mechanism for the pepper, ceramic precision mechanism for the salt and fine or coarse adjustable grind. One salt and one pepper refill included. Helium Inflated Sphere, Yellow (PMS 116) 10'Dia.